Like a scene out of an action movie, a Falmouth driver faced an unthinkable situation earlier this month as his Honda Accord became wedged beneath a Freightliner tractor trailer along the northbound lane of the Maine Turnpike. Remarkably, neither the Honda driver nor the truck operator endured any serious injuries in the collision, however both were transported to Portland’s Maine Medical Center for observation and quickly released. According to eyewitness reports – including first responders and the Maine State Police – the 36-year old Honda driver was traveling along the innermost left lane, adjacent to the truck traveling in the center lane. As the truck inexplicably began to drift left into the Honda’s lane, it too veered to the left to avoid a sideswipe collision. From there, the Honda driver is believed to have over-corrected the swerve, causing his vehicle to lodge beneath the truck’s rear tandem. Following the incident, state police closed the turnpike for about 20 minutes to allow a heavy-duty tow truck the opportunity to elevate the tanker off of the Honda, at which point the totaled automobile was hauled away. The truck involved in the wreck is owned by Hartt Transportation Systems, and is typically used to haul spring water for Poland Springs, a division of Nestle. At the time of the crash, however, the tanker was completely empty – which may have prevented a greater catastrophe. While thankfully no one was seriously injured in the truck accident along the turnpike, the Honda driver is left completely without a vehicle – and will likely feel extremely apprehensive the next time he is traveling alongside a tanker truck. Are these damages compensable? Based on the information so far, quite possibly – particularly if the tanker driver was negligent in swerving into the Honda’s lane. When determining liability after a truck accident, the plaintiff must prove that the truck driver owed him a duty of care and precaution, and breached that duty in some way that resulted in injury. Under Maine’s laws of comparative negligence, the Honda driver could have his award reduced if the facts suggest that his own negligence contributed to the accident. For instance, if a jury determines that the Honda driver was negligent in his over-correction following the tanker’s drift into his lane, he could face a percentage-based reduction of the verdict in an amount congruent with the jury’s measure of his contribution. It is, of course, too soon to tell how this case will resolve – and oftentimes parties are able to reach a settlement prior to taking the case before a judge and jury. 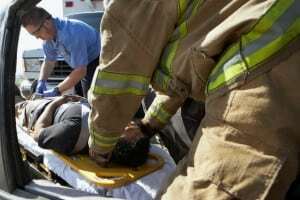 Should the Honda driver prevail in a personal injury lawsuit, he could recover not only the medical expenses and property damage caused by the wreck, but possible compensation for pain and suffering as well. If you have been involved in a collision and would like to discuss your legal options with experienced Maine accident attorneys, please contact Hardy, Wolf & Downing today at 1-800-INJURED to arrange a no-cost case review.